UPDATE!!!! : DAY 9 AND SO FAR IT’S WORKING!! 2 WEEK UPDATE!! IT’S AMAZING! 3 WEEK UPDATE!! I’M CONVINCED!!! Ok so I’m trying something new. I’m not sure if it works yet because I’m only on day 5. But I started a massive purge on like the third day and it was so bad yesterday but today it seems to be clearing greatly. So I’m really really hoping to have good news within the next week. But I’m using magnesium oil topically mixed with one drop of sweet orange oil. I wanted to post my progress on here. Fingers crossed!! Day 6: A little more info on magnesium Oil. It’s just magnesium Chloride so a type of saltwater. However, on top of having deep cleansing and drawing properties it’s also easliy transdermally absorbed making it a good source of magnesium, which is also helpful for acne. However, I was reading articles from NIH’s site and their research found that Magnesium oil alone doesn’t seem to have antiseptic properties BUT it does when combined with citrus oil (why I’m adding sweet orange oil to my magnesium oil). So my theory is that the saltwater will draw out the impurities, infection, blackheads etc, while simultaneously supplying my skin its magnesium, and then the orange oil will acts as an antiseptic to kill the bacteria and infection that’s drawn out. So far, it’s working, but like everyone on this site I’ve tried about 1000 different things so I’m afraid to get excited yet. I have pictures but I don’t want to post anything until start seeing significant improvement. I’m coming to the end of the purging phase. My plan is to switch to using the mag oil/sweet orange oil combo just at night and the mag oil alone in the mornings once everything clears because it does burn a little with the orange oil. I just think it’s important at this stage to keep the bacteria under control. 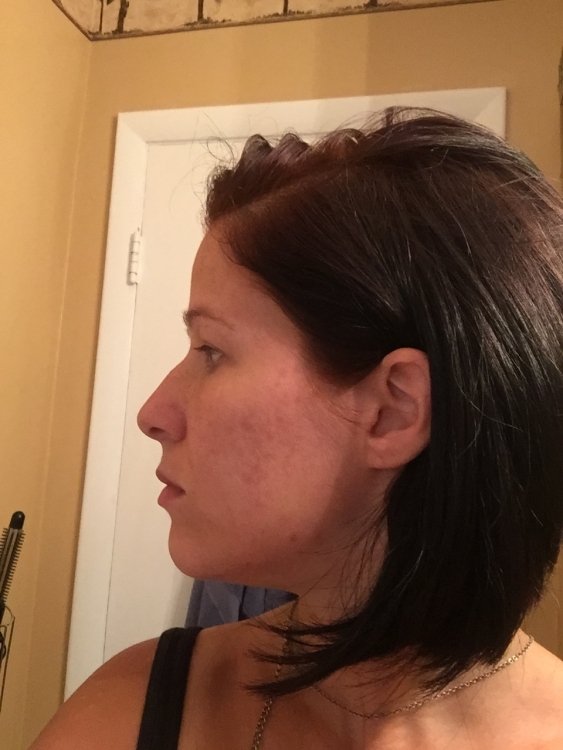 Sooo another note, in case anyone looks at my profile and sees I was on here like 4 or 5 years ago: YES I GOT BEAUTIFULLY CLEAR WITH THE CAVEMAN REGIMEN!!!! It was amazing, you can see from my final picture my skin was gorgeous. And it stayed that way for like 2 years. I think i almost forgot my acne woes. Then we moved back to America 18 months ago (we had been stationed in Japan) and my skin has just gotten progressively worse. I have no idea why. I don’t know if it was stress, (we came close to losing our daughter 10 months ago on top of buying our first house and moving 3 times in one year) or diet change, or the fact that I started adding things into my skincare and got farther and farther away from the minimalist approach....idk...maybe it was all of that together. We never really know, do we? Day 7: significant improvement! There are almost no new pimples being brought to the surface. Most have either surfaced and already popped and are flaking away. There are about 3 deeper ones that are still working their way up, but they’re ones that I didn’t even know existed and they’re in the trouble spots below my cheek bone. I’m not surprised there where a few laying dormant in there. Like I was telling my husband, it doesn’t LOOK like significant improvement at a glance but I can clearly see the purge is ending and now the healing has begun. right now I’m washing my face once a day because I have to clean off the make up. My hope is to get back to seldom washing once I don’t have to use as much makeup to cover everything. I’m kinda laying low and staying home as much as possible to avoid using makeup. But I have to go to work tomorrow so I’ll be using make up then. I did just use a bentonite clay mask to hopefully speed up the purging/healing process but I don’t use them too often, maybe once a week. Ok so it’s been 11 days now and I’m still very happy overall. I will say the past week has been VERY tough because this really brought EVERYTHING up and out. So day 3 the small clogged pores close to the surface came up and that was bad enough but then a few days later, like day 5 and 6, the monsters from the deep emerged... ugh!! now...that’s really great news because it means it’s definitely working, but it’s horrible because that means I’ve gone thru a massive purge that has been super difficult for me to deal with emotionally. BUT the really awesome news is that it really seems to be coming to an end and I can see drastic improvement and clearing. So this is what I’m gonna do: I’m going on vacation tomorrow for 8 days. I’m going to continue everything exactly how I am now except unfortunately I’ll have to wear more makeup since we’ll be seeing family and friends. My plan is to finally post pictures of before and after when get back. I figure another 8 days should make the improvement undeniably clear if it’s still really working. So I may not post any more updates over the next week...or I might if I have time. Alrighty I think I’m really excited about posting progress pictures! Im gonna post on Monday! I’m only going to post, though, if there’s continued progress. The way things have gone for the past two weeks have me pretty certain this is really working. Oh and in case anyone is wondering, I am one of the many that has “tried everything”. bp combined with erythromycin Worked amazingly for like 6 years. My skin was perfect. But then about 5 years ago I decided I didn’t want to be dependent on prescriptions so I tried going natural. 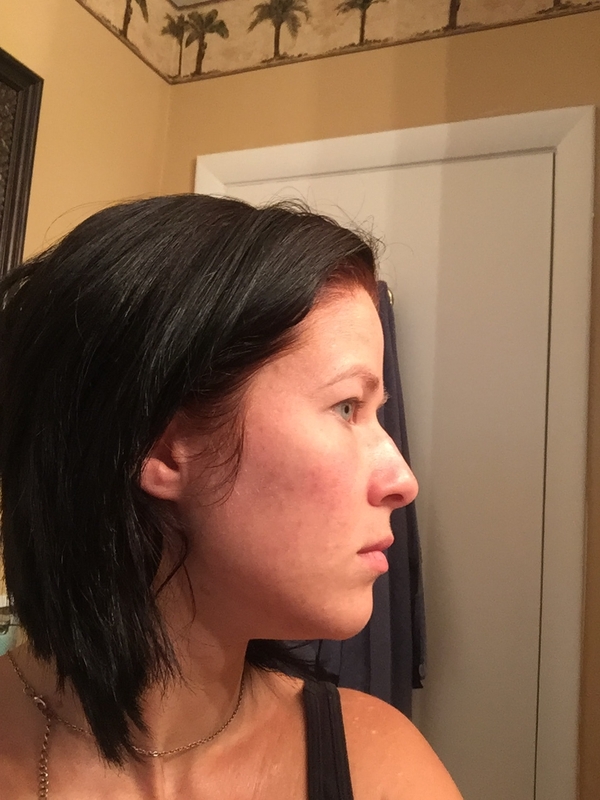 I tried oil cleansing and that was a disaster...absolutely horrible for my skin. Then I tried caveman and my skin went back to being perfect and stayed that way for about 2 years. Then this past year I started breaking out again. I haven’t been able to figure out the cause. But finally, the magnesium oil is the first thing that’s making a real difference. PM: splash face with water and use a few sprays of magnesium oil. I only use a cleanser on the days I wear makeup (which right now is almost daily) but as my skin clears, I can wear less makeup so I’ll be washing less. But my routine is so simple right now and it’s really working so far! And this is today, day 24 or using just magnesium oil with sweet orange oil. As you can see, SIGNIFICANT improvement. So I’m just gonna stick with this. I mean, it’s been steady improvement since the purge ended about 2 weeks ago so I don’t see why the improvement would stop. I expect to have perfect skin soon, like in the next two weeks. I’ll keep updating!! Oh! I should add this is the progress even with 2 setbacks! The first, I tried to add another ingredient to the mag/orange oil combo 3 days ago and my skin did not like it. 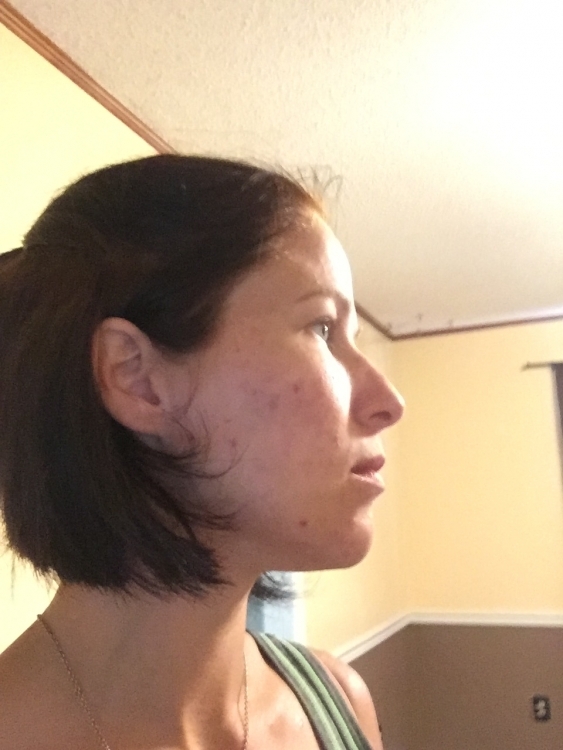 I saw immediate halt in improvement and I started seeing some clogged pores. So I went back to just mag/orange oil. The second, my period started today. SO pretty amazing that my skin looks this good despite those two things. Still amazing progress!!! It’s been 5 weeks now, I think and my skin is doing fabulous!! I’ll post pictures over the next day or two. Please try this! It’s so easy and simple. My skincare routine has become so simple and easy. Evening: wash face with Burt’s bees face wash and then use magnesium/orange oil. That’s it! And it’s WORKING!!!! Sorry to see no one has replied to your posts but good for you to continue making updates. Where did you find out about magnesium oil? I've heard of people taking supplements but never using an oil? In terms of what your skin looked like before you started with the oil - was it moderate, cystic, just small whiteheads/blackheads etc.? When you're using the oils combined do you use them in a spray bottle or mix them in your hands and apply that way? Hi! I’m glad someone finally responded! Lol I’m just so excited that this could help people. I posted pics of before and after, they’re several posts back. I would say it was moderate. It was mostly nodules and pustules along my cheekbones and jawline with some smaller whiteheads on my forehead. I found out about magnesium oil as a supplement years ago. Using it topically is supposed to be better than taking it orally for absorbtion. But the thing is, it’s not actually an oil at all, it’s a type of saltwater. It’s just magnesium chloride in water. My skin was so bad a few months ago I figured what the heck and I sprayed it on my face. Within like 2 days I noticed all the hidden little ones were surfacing as small white heads. The purging did get pretty bad, but now the purging is long gone mad my skin is almost perfect! I found out that sweet orange oil is a great antiseptic so I added like 20 drops into the bottle of magnesium oil. It smells AMAZING! It’s the consistency of water so I use it like a toner. I pour like a 1/2 teaspoon maybe less in the palm of my hand, and then rub it all over my face and that’s it. I only wash my face once a day at night but I use the mag oil morning and night. My skin has done a complete 180!!! So I just took these like 2 min ago. My skin isn’t 100% yet because the hyperpigmentation has to continue fading, but I mean it’s amazing compared to what it was. Look back at the before pictures I posted, it’s crazy! That's amazing. Your skin looks like it's on its way to 100%. Thanks for the info. I can't view the pictures for some reason but happy for you and your progress. I purchased some magnesium oil yesterday so will try it for a while and see how I get on. I don’t know why they didn’t post, I’ll try again. Just be prepared for the purge, but you can tell it’s definitely just bringing everything out because a small hard lump under the skin becomes a Whitehead within like two days. And now, my skin is completely smooth. Before I started this, my skin was so lumpy and bumpy it was just awful. So as you can see (hopefully) there is some hyperpigmentation BUT zero active acne or bumps. So now I can easily cover with a little makeup and my skin looks perfect. The residual marks will take another couple weeks to fade completely. But it’s definitely not a fluke or temporary or whatever because I’ve been doing this for 2 months now and there’s only been steady improvement. Wow! Amazing results! Can you provide links on the oils you used? I'm in the UK and purchased an oil from a health food shop (Holland and Barrett). I have had a few small whiteheads crop up but nothing too bad. I do have a weird rash on my stomach though. I found this video on YouTube which was very interesting. This is also the product I have been using. I did have a bad purge, but for me, I think that was necessary. I mean all that crap was just hanging out under my skin and it needed to come out. 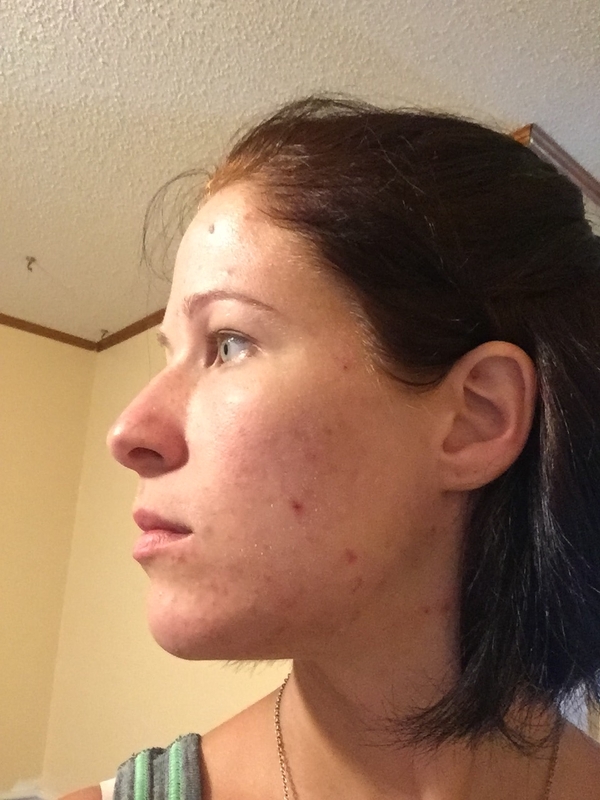 I had been applying it to other areas(although not daily) and I wasn’t seeing any improvement in my skin. It wasn’t until I started using it on my face directly that I started seeing drastic results. I think mixing it with sweet orange oil is key though AND it does sting like heck on broken skin so brace yourself. But I’m telling you, it’s been two months now and that’s all I use. But a therapeutic grade 100% sweet orange oil. You can probably get it on Amazon for like $10-$15 and add like 20-30 drops to the bottle of ma oil, shake it up, and you’re good to go. The mag oil I use is by Asutra. I don’t think the brand matters and long as it’s just magnesium chloride and no other ingredients. I’m telling you though, this is all I’ve been doing and as you can see from the pictures I’m getting amazing results. For me I will skip the orange oil. I have tried using it before on my skin and it seemed to irritate it. I am quite sensitive though. Do you use a cleanser or moisturiser? Or does the MO work for you as a moisturiser? My skin is often dry. Currently I am using a few drops of grapeseed oil but no cleanser so just wash with water, add grapeseed oil and then spray MO on other parts of my body. It's helped with my sleep too. What's your diet like too? Did you change anything around the same time? If you eat something naughty would the MO counteract it and prevent a breakout or would you still need to be careful? 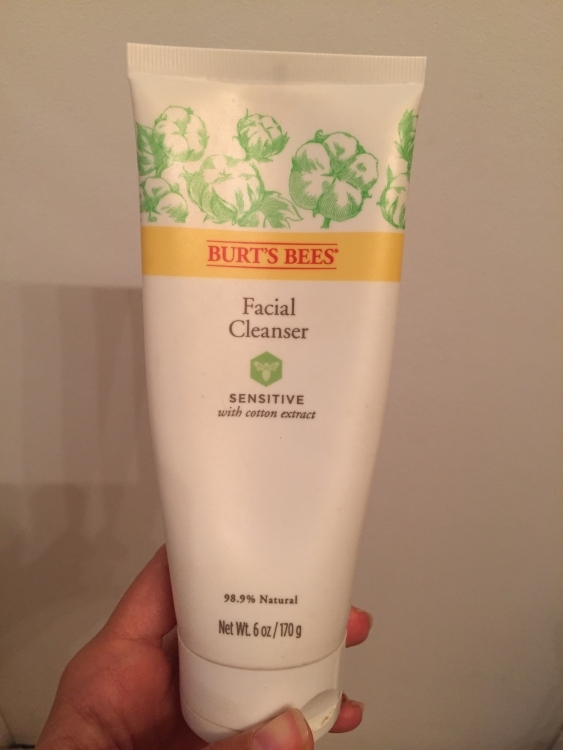 I’m using a mild cleanser from Burt’s Bees that i absolutely LOVE. I’m just using it at night to wash off makeup. And I don’t really pay much attention at all to what I eat. 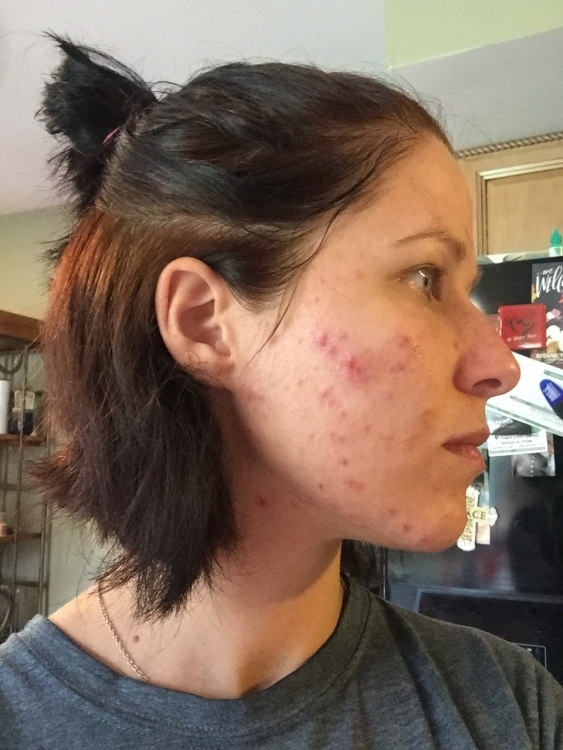 My acne doesn’t seem to ever be diet related. I do happen to eat healthy. We eat mostly organic and we really don’t eat much sugar. But my skin had a steady decline through this year even with eating healthy so I think my acne is more hormonal. I use no moisturizer now whatsoever. I used to use different oils but the MO has made my skin so soft and hydrated, it’s completely eliminated the need for moisturizer of any kind. My skin never feels dry or oily, it’s just a perfect smooth even tone and texture and hydrated. I could tell he difference with the hydration like within the first few days to a week. 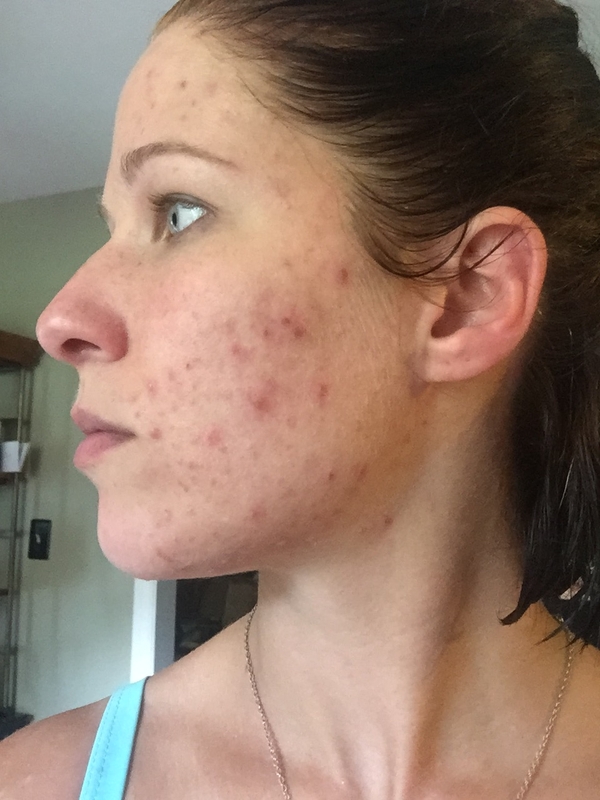 Even when I was purging, the surrounding skin felt much healthier.